Knee arthritis symptoms hurt and the pain can be very severe. Knee arthritis symptoms can be helped with omega 3 and chiropractic help exercises and treatment. It obviously is a vital joint in locomotion and, with all the research coming out contrasting how fast you can walk and longevity, arthritic pain in the knee doesn't just make you miserable; it literally cuts short your life too. For more details see lower down at the walking speed paragraph. So, what are the symptoms of arthritis? Remember there are really several joints in the knee; between the kneecap and the thigh bone, and between the condyles of the femur and the tibia. Patella symptoms are far more amenable to conservative chiropractic care. Read the section lower down on patello femoral pain syndrome. Stiffness and crepitus are amongst the first symptoms. Can you see in the graphic below how the hyaline cartilage that lines the end of the tibia in the knee has been completely worn away leaving the raw bone exposed? Loss of that joint space means pain and swelling too. First and foremost the patient with arthritis begins to feel stiffness. We'll see later the reasons for it, but the chief sign of degenerative knee arthritis is loss of the range of motion. What may be confusing is that sometimes there is a loss of flexion and you can't bend your knee fully; and there may be loss of extension and you can't straighten the joint completely. Either way, it inhibits your walking; you develop a limp and there's a knock on effect on the hips and spine. Invariably this limp leads to sacroiliac joint pain; worse it may lead to slipped disc symptoms. Use the search function at chiropractic help for more information about these terms. In short, point out someone to me with knee arthritis, and I'll confidently tell you that they also have low back pain. In the early stages one of the first knee arthritis symptoms is a grinding or clicking sound. Careful analysis is required; is this sound coming from under the kneecap, from within the knee proper, or even referred from the hip joint? One of South Africa's leading orthopaedic surgeons once told me that many a knee is operated on, when in actual fact the problem is in the hip not the knee. I can appreciate that, the click from a hip condition reverberates right down the leg, easily misleading the hasty examiner. Crepitus under the patella, causing patello femoral pain syndrome is readily treatable with conservative chiropractic means by gentle polishing off of the sharp crystalline deposits, but that from within the knee is far more difficult. Another cause of creaking sounds is a damaged meniscus which can even cause a locking knee. This may need to be surgically treated, though not necessarily so. For an example of the chiropractic management of the acutely injured knee, read more lower down. Yet another cause are joint mice. These are pieces of cartilage that have broken off and are floating in the synovial fluid within the knee; they may become entrapped between the femur and the tibia causing locking of the joint. These bits may break off from the hyaline cartilage lining the bones, or from the menisci; they float in the synovial fluid in the knee joint and, should they drift between the ends of the femur and tibia in the joint, they will cause sharp, stabbing pain and a locking of the knee. It may be you can't bend your leg, or you can't straighten it. The pain in the arthritic knee is often a dull ache initially but as the condition develops the pain becomes exquisite causing ultimately severe disablement. Stairs become an enormous challenge. Known as oedema in medical terminology, knee arthritis symptoms invariably include swelling. 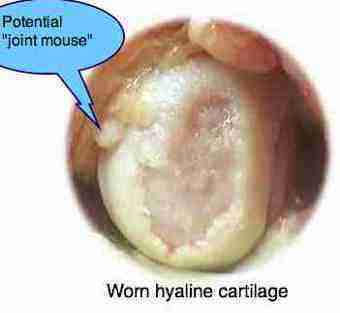 Inflammatory agents released from the decaying cartilage retain fluid in and around the knee. This fluid may occasionally be targeted by circulating bacteria causing a bone infection. A throbbing pain at night calls for an orthopaedic opinion in my book. Probably the most common cause of the knee arthritis symptoms is an old sporting injury. In football crazy Holland, and rugby crazy South Africa the wrenched knee causing injury to the ligaments or meniscus is common place. I'm sure it's no different in basketball and American football. Competing for first place is obesity. Simply put, the extra weight results in the cartilage of the femur pressing directly down on the cartilage of the tibia, something it was not designed by the Almighty to cope with. The result, knee arthritis symptoms. There are few obese people who escape the pain and disablement of knee arthritis. More complex are dietary deficiencies. For example it is now fully accepted that a magnesium deficiency in the diet causes the deposition of calcium in the cartilage causing ChondroCalcinosis, a disabling arthritic condition often affecting the knee. More serious, a magnesium deficiency also causes inflammation of the arteries. Read more about the importance of this mineral at magnesium heart. Again, use the search function. Surgery. In the past, damaged menisci were completely removed resulting in bone on bone in the knee with inevitable onset of knee arthritis symptoms. Even conservative arthroscopies can set up inflammatory reactions within the knee. See more at arthroscopy knee surgery. The final cause that comes to mind is infection. This is less common today with the antibiotics available, but bacteria in the synovial fluid in the knee may attack the cartilage causing severe arthritis ultimately. Any and all surgery can and does periodically cause what is known as nosocomial, hospital acquired, infection. According to Wikipedia 1.7 million such infections cause 99,000 deaths in the USA alone each year. This is largely, of course, because many of the bugs in hospitals are drug resistant. And now let's consider a case file. Mrs P, middle aged, consulted us with severe left knee pain. 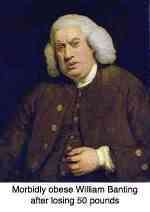 The pain had begun some ten years previously, but grew progressively worse, especially the last three years. At 5'1" and 207 pounds she had a dangerously high body mass index; not only her knee but her very life was under threat; read more at this remarkable case file, symptoms of arthritis in knee. See the link in useful links at the bottom. As with any chronic condition, much of the responsibility lies with the patient to look after their own problem and in this instance that means daily exercises for knee arthritis; they take only few moments. Done several times a day they will bring enormous benefits that you can get no other way. Get you life back; in part with exercises. The alternative that await those who refuse to obey is increasing disability and pain. And a bill of about sixty thousand dollars. Sometimes in knee arthritis a communicating vessel develops between the synovial fluid within the knee proper and a bursa behind the knee. Forced flexion of the knee, or overexertion forces fluid from the knee into the bursa, forming a large mass behind the knee causing acute pain and limited bending of the knee. Read more about Bakers cyst knee. What about nutrition, in particular the omega 3 fatty acids and magnesium? There is oodles of evidence now that arthritic joints need fatty fish like salmon and herring, fish oil or, if you are vegetarian, freshly ground flax seed. 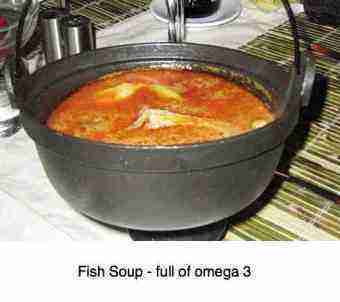 Try this delicious fish soup recipe remembering that the omega 3 is to be found in cold water fish mainly. Not only is it good for the joints but it's central to the heart stroke diabetes regimen; it's astonishing that researchers have found that almost 50% of deaths are caused by diet alone. Pain under and around the kneecap, or patella, is not uncommon. The stress on the cartilage is enormous when squatting. In addition, it's a joint where calcium deposits tend to form, not unlike "toothpaste shoulder". Falls directly onto the kneecap, or simply long hours of kneeling in the garden can injure the cartilage, deposits of rough calcium crystals form, and then it becomes arthritis. Patello Femoral Pain syndrome responds remarkably well to conservative chiropractic help of the knee. How fast you can and do walk is directly related to how long you will live. So a condition such as knee arthritis symptoms doesn't just hurt, cost you a lot of money and make you dependent on others; it also cuts short your life. It's just one more reason to take seriously the prevention of knee arthritis; and if you already have it, then do find a solution. The tough part is that losing a significant amount of weight is usually the most effective treatment; research shows that your walking speed really has an important influence on your longevity. Instead of yet another expensive fad diet, consider these principles of healthy dieting. Read up and grasp the meaning of the term "glycemic index"; it concerns how fast insulin, the fat hormone, is released after a starchy meal. Carbohydrate Count Chart explains all. Don't be afraid of the healthy fat in your diet, but do cut out foods fried in polyunsaturated oils. Use olive oil freely and remember that butter is back. Indulge in the so called phytochemical foods; that means plenty of salads and fruit. Use only olive oil and lemon juice for a dressing. Walk, cycle or swim every day. Severe trauma to the meniscus or ligaments is often considered a surgical emergency. If there is instantaneous massive swelling if often means the anterior cruciate is ruptured, and then there's no alternative. However, there are lesser injuries that cause severe pain and a locking knee. Read more at this acute knee trauma case file. Every chiropractor worth his salt has to be a bully periodically. Never is this more true than with knee arthritis symptoms. They are usually caused by a combination of old trauma and current obesity. If your chiropractor cannot convince you to get it off, you will have a total knee replacement; maybe two. Never will I forget the elderly German patient, one of my favourites, who came for a routine consultation, only to tearfully tell me that previous week his otherwise healthy wife had died. After a total knee replacement, a fatty embolus progressed from her leg to the lungs. She never left hospital. Knee replacement is far more difficult than hip surgery. Anti inflammatory omega 3 for knee pain; it's all about flaxseed and fish oil. Symptoms of Arthritis in knee ... a case file.